When it comes to well-being, immersion and productiveness acoustics really matter. To soften the noise level of the library building whilst adding a homely and warm look and feel as well, a myriad of noise reducing materials are specified for the renovation of the University of Copenhagen. 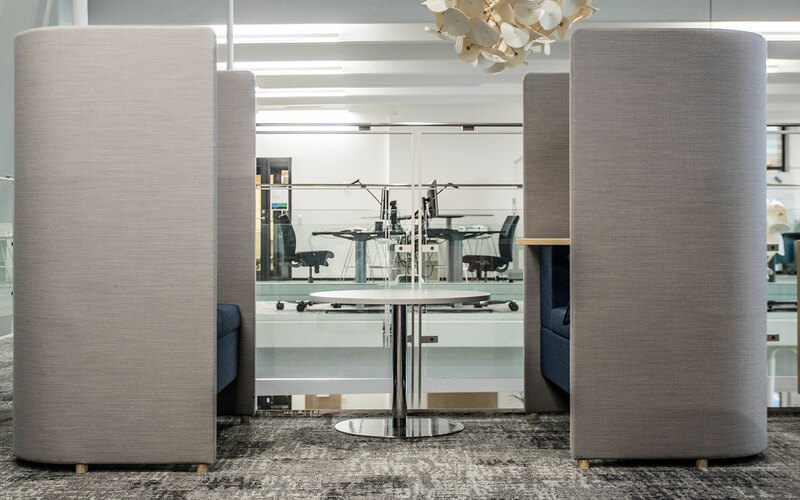 All this to create a sense of belongingness and an ideal workspace for students finishing their Master’s Thesis – maybe at a higher quality level and within a shorter period of time due to the beneficial surroundings. A goal in favour of both students and university. 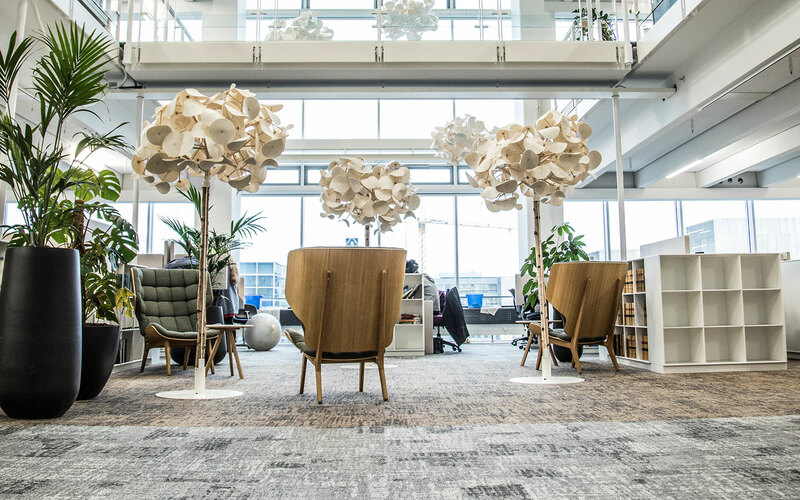 To Andersen, the choice of carpet flooring is obvious as he wishes to exploit the noise reducing properties of this soft and textured material. 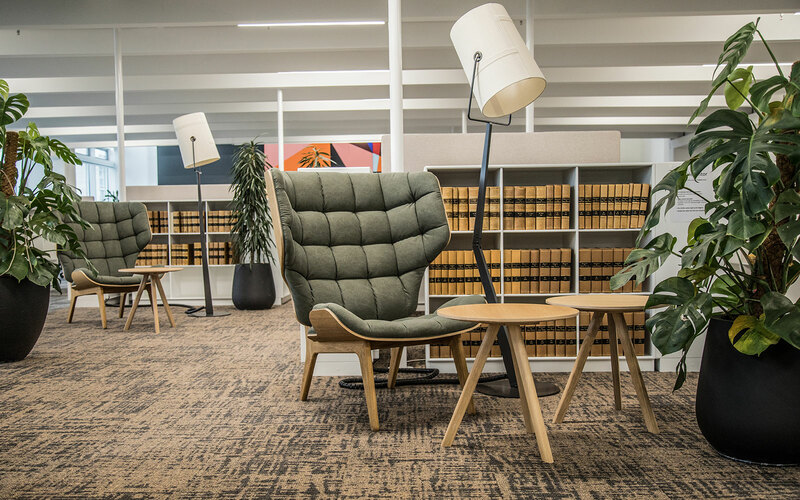 The specified ReForm Memory Ecotrust carpet tiles meet the architect’s desire to use the floor design to indicate a shared common area in the middle of the library, with several individual and intimate workspaces surrounding the center along the walls. 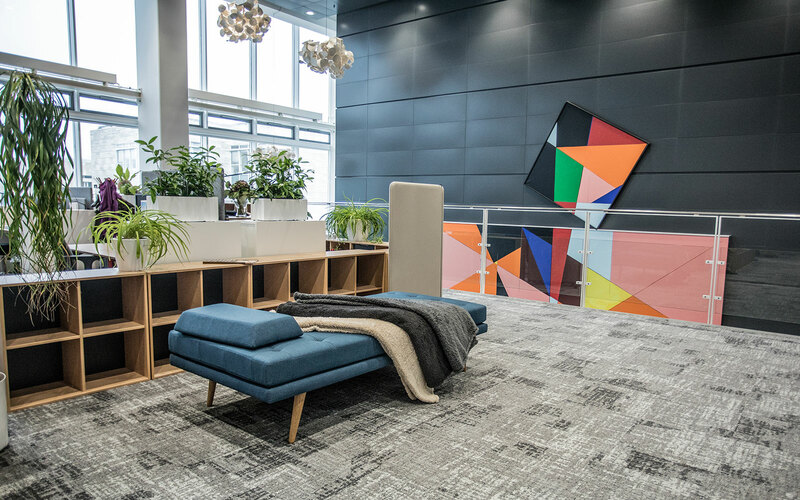 The shared center area is identified by using a warm brown and black colour combination from the Memory collection, whilst the workspaces are defined by a more vibrant design in contrasting bright and dark colours. Also, the ease of exchanging damaged or timeworn carpet tiles was an important aspect too. Big panels in a dark coloured and soft felt material are mounted on the walls and ceilings to prevent sounds from escalating in the room. Upholstered furniture items as chairs and sofas as well as lamps made from small sticks with attached felt rondels also have important acoustic functions. The choice of colours, primarily based on neutrals as white, grey and black create a basic visual calmness, ideal for enhanced focus and efficiency. Combined with warmer brown tones and a sprinkling of light woods species and greens from big plants the library is enriched with a homely and cosy atmosphere. A complex structured multi-level loop and digital colouration give ReForm Memory Ecotrust a unique expression. The collection comprises three designs themes, each in 9 architectural colours structured around light, medium and dark tones to use in combination. To create zones at the University of Copenhagen a brown Place design is matched with a white, grey and black design from the Moment design theme. The patented Ecotrust felt backing is produced from recycled water bottles that are turned into a soft yet strong PET felt material with great acoustic performance. At ege carpets we use Aquafil’s ECONYL® yarns produced from used fishing nets. Once the fishing nets are collected and cleaned, they are physically and chemically broken down and reborn as strong and hardwearing yarns for carpets. ReForm Memory Ecotrust is Cradle to Cradle CertifiedTM and available as broadloom, 48x48 or 96x96 cm carpet tiles and the innovatively shaped Figura tiles. Want to explore the collection further? Get your own ReForm Memory Ecotrust sample or brochure right away! We installed the carpet first and the desired effect was impressive. Acoustics improved dramatically!